Home › Tips for Dating › Are the Holidays Bah Humbug [ :( ] or Happy [ :) ] for you? It’s a known fact, how you approach life will impact your experiences and how people experience you. The holidays present new opportunities to meet new people, especially friends of your close friends. It is possible that you can meet your soulmate during the holidays, as well. We are naturally drawn to positive, fun and affirming people. How do you you think people view you? Are you warm, approachable, happy, cheerful and positive most of the time? Or are you a worrier, negative, sad, angry and critical? We all have stresses in our lives even though we may not show it. And other times, we wear our hearts on our sleeves, showing our true selves. The holidays is about giving and sharing. It doesn’t mean we have to be with a romantic partner, although it may be nice to have someone special to share this time of year with. As you meet new people during the holidays, be aware how others can feel your energy- positive or negative (or your vibes, as some call it) and it does affect how attractive you are to others. We are not talking about only physical appearance. It’s what you exude from the inside out. As a solo how do you keep yourself positive and upbeat when you do meet new people during the holidays? Here are several strategies that may work for you. You may try one or them all! 1. Decide to only hang out with positive and affirming people who care about you and think you are the best. Do ditch those negative Nellies! 2. Adopt an abundant mindset. That means there are plenty of great guys (or gals) waiting to meet you! Coming from a place of scarcity doesn’t serve you. 3. Find a positive wing person who can help you meet new people and who is a trusted fan of yours. Perhaps it’s time to widen up your face-to-face social network! 4. Participate in activities that make you feel good about yourself. Try volunteering for a cause that you believe in. Be with others who are also giving of themselves. 5. Spend time with your loved ones, be it a parent, elderly relative or a child. They will appreciate your attention and value your time together. No matter what, the holidays are time for being with family or close friends. Instead you may decide to go out of town to take a trip with other singles to meet new people. If you feel positive about life and yourself, then others will surely be attracted to you. What most people want is someone they can enjoy life’s experiences with, as well as, be someone who accepts us for who we truly are (the good and the bad). And the best thing you can do is to focus on what you have to offer to a relationship, and instead of on your deficiencies when you are out to meet new people. You do deserve to have a loving mate in your life. Here’s to having a happy, healthy and upbeat holiday season! PS. 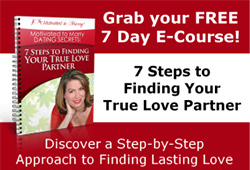 If you are READY to get your love life on track for the New Year, then let’s talk! Go to www.TalkwithCoachAmy.com to for a complimentary Meet Your Mate Strategy session – and we’ll set your course for finding true love in 2017! ‹ What’s your plan for the January Dating Blitz 2017?